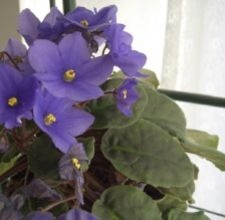 Many African violet enthusiasts use specially designed self-watering flowerpots for their plants. A classic African violet pot has two parts: a bottom section to hold the water, and a top container to hold the soil and the plant. The plant container sets into the lower section to drink up the water as needed. Once you’ve planted your African violet in the top potion of the planter, use it correctly, so you don’t over water your plant. Touch the soil to see if it needs irrigation. If it is dry, it is ready to water. If it is moist, it does not need to be watered. Fill the bottom section of the African violet pot with room temperature water, if the top of the soil is dry. Don’t use house water if it is treated with a soft water system; instead, fill with untreated water from the outside garden hose. Set the plant container (with the African Violet) on the water pot. The plant will drink up the water from the bottom of the container. Remove the plant pot from the water when the soil feels moist. Discard the water. Repeat when the top soil feels dry again.